The unique WANDERING ITALIA Project combines the elements of adventure, photography, nature, culture, history and mountaineering: the aim of my expedition is to solo hike the Appennini and the entire Alpine Arc, reaching the most important mountains, parks and nature reserves of Italy and following the famous Grand Italian Trail (Sentiero Italia). Crossing half of Italy has been my dream for more then two decades and now I feel ready and free to make it come true! I’m not doing it to beat any record but to discover, enjoy and let others enjoy the beauty of my country, advertising the passion for trekking, nature and outdoor experiences. I will be capturing and reporting everything by my photo-equipment, audio & video recordings and my articles. It begins in the Apennine mountain chain, at its highest pick Gran Sasso d’Italia, then crosses the entire Alpine Arc and finishes in Trieste. 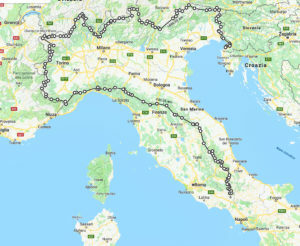 It covers the most difficult half of Grand Italian Trail, which entirely has been hiked only by one person - Lorenzo Franco Santin - who needed two attempts to complete it in 2017. One of the most important features of my challenging Project requires me to carry heavy loads through rugged terrain for thousands of kilometers - only my photographic equipment will weight around 10 kg as sharing with others will be an important part of my expedition. Furthermore I will carry with me my tent, the sleeping bag and all the necessaries to be able to camp outside: I will try to use as less as possible any accomodations, only when needed to wash myself and recharge part of my equipment. I’ve already decided to postpone about 15 days the starting date (right now fixed on the 14th of May) hoping that Spring will melt some of the heavy snow - still at today situation over the Alps - before I will reach the high altitudes (even more than 3000 m a.s.l.) of the alpines peaks. A lot will depend from the weather which will be influencing also my schedule: I’ve been going through the route for already 3 times and I hope to finish the journey in about 110-120 days, anyway before the cold will take over the Alps again. A lot will depends from me, mostly, from my condition physically (i.e I hope the two plates in my right leg will not be a big trouble) and mentally to face the difficulties, the loneliness and all the unexpected I will probably encounter during my journey. I’ve been taking my precautions to be easily traceable and to call for help in case of danger. There are still many question marks due the fact of facing more than 3500 km of completely unknown, starting from the path, the conditions, and also the danger of the wildlife such bears, wolves and boars I might (and I hope I will!) encounter during my hike. But the excitement is growing too, realizing I’m going to do something exceptional, facing Mother Nature and her beauties (and dangers), and having the chance to know myself better… and it’s not a small thing! The Facebook page inerro.land and the new website only about this expedition wanderingitalia.it will be my main channels to update you over my progress in the route, sharing images, videos and my feelings. I hope you will follow me: I will need your support too! I started my journey the 14th of May 2018 and, unfortunately, I had to stop at Monte Viso after 52 days and "only" 1550 km. Even if I didn't manage to reach the final destination - the already injured leg forced me to stop - Wandering Italia has been an amazing experience and unforgettable adventure: I reached astonishing places and met wonderful people; I faced pain and troubles but I also gained a lot of happiness, satisfaction and pride; and I proved to myself, and hopefully to others, that dreams can be chased and that we should do everything we can, to fulfil them. If we really want, we can do everything and we can find our own way! I decided to write a book about this journey but also about the reasons behind, and I'm still working at the thousands of pictures I took during the trip, which will be soon available, also to purchase, on this site (in the meantime, please have a look of the video below). After the presentation of this project at the Malmö International School, where we have been focusing on the importance of find our own way to the happiness and satisfaction in life, I will continue to present Wandering Italia around, in Sweden and Italy. For more info, regarding also the launch of the book and photo-book, please check my Facebook page or wanderingitalia.it where you can also find the latest news and the daily updates I wrote during the trip.